The cheque books are listed in the Tools Box. Click on the cheque book, the history of the cheque book will be listed on the main panel. The icons in the Tool Bar are "New", "View", and "Print". New - Create a new cheque in the current cheque book. Edit - Edit selected cheque. Import - Import cheques from CSV file. Print - Print selected cheque. Delete - Delete selected cheque. User can right click on the main panel to open the popup menu, which provides same function as in Tool Bar. Click "New" or "View" will open the cheque book as follow. In the Tool Bar, you can save and print the cheque. You can also switch to a new cheque or click the "Forward" and "Backward" button to switch to another cheque. In below, you can fill in your cheque details or click the "Payment Voucher" buton to prepare payment voucher. Account - gives the current account information, name and account number. Cheque Number - the cheque number that generate from the defined sequence automatically. You can overwrite the number by clicking the button next to the box. Void - mark the cheque as void and the information of cheque will not get into the calculation of reports. Date - date of the cheque. Click the "Calendar" icon to pick the date. A/C Payee Only - mark the cheque as "Crossed". Bearer - tick the box if you want to make the cheque as "Bearer Cheque". 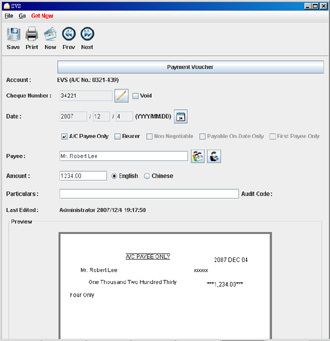 Payee - Fill in the Payee Name or click the icon to select from the Payee List. Amount - Input amount of the cheque here. Select "English" or "Chinese" for the written text. The text will be generated according to the input amount automatically. Particulars - A field for you to store some notes about this cheque. 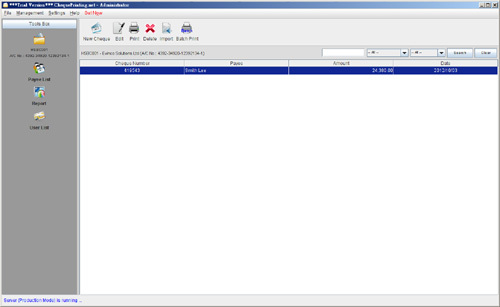 While you fill in the cheque details, the preview pane will show the cheque image at the same time.